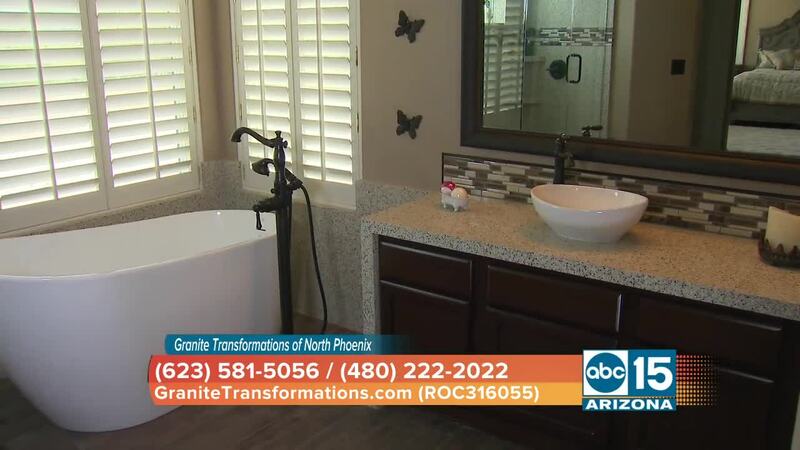 Granite Transformations of North Phoenix is a paid advertiser of Sonoran Living. Granite Trend Transformations take the stress out of your renovation, since all of our surfaces can be installed right over you existing countertops as a countertop overlay - eliminating the need for messy and time-consuming demolition. Our surfaces are available in a variety of colors and patterns and are a perfect fit for home renovations such as kitchen countertops, bathroom vanities, shower walls, tub surrounds, fireplaces, flooring and more. They are also perfect for commercial settings such as restaurant counters and bar tops, office tables and countertops, hotel kitchens and bathrooms and so much more. All surfaces at Granite Trend Transformations are made with only the highest quality quartz, granite and recycled glass. By choosing Granite Trend Transformations for your remodeling project, you are also making an eco-friendly choice as our simple no-demolition process prevents countless tons of materials from entering landfills. Additionally, many of our products - such as our recycled glass surfaces - contain up to 78% post-consumer recycled content. 1. Schedule a FREE In-Home Design Consultation. 2. Receive our All-Inclusive Quote.